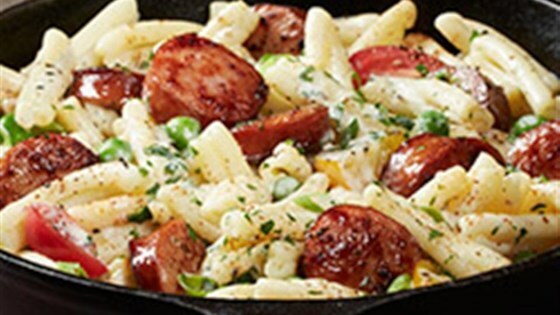 "This creamy pasta and sausage dinner gets some heat from Cajun seasoning, and it's ready to serve in 15 minutes." For added fresh flavor add 1 cup frozen green peas in last 3-4 minutes of cooking pasta. Continue as directed. For added visual appeal, garnish with chopped tomato and sliced green onion, if desired. Make the alfredo sauce in a separate pan and incorporate all the ingredients when they're done- since sausage tends to be greasy. this was a HUGE hit in our household! 2 thumbs up by all (7,8, and 10 yrs old) must make again! super easy too! will definitely be on our monthly cook list!